The film will present Putin’s viewpoint of political events since he was first elected president of Russia in March 2000. “It opens up a whole viewpoint that we as Americans haven’t heard,” Stone told the newspaper, adding that his crew went to see the indefatigable Russian leader four times over the course of two years. The 70-year-old director also commented the accusations of Russian influence on the US presidential elections. “That’s a path that leads nowhere to my mind. That’s an internal war of politics in the US in which the Democratic Party has taken a suicide pact or something to blow him up; in other words, to completely de-legitimize him and in so doing blow up the US essentially. “What they’re doing is destroying the trust that exists between people and government. It’s a very dangerous position to make accusations you cannot prove,” he added. Stone also said does not believe claims circulating in the mainstream media that Moscow allegedly passed some classified documents to WikiLeaks in a bid to influence the November US elections. “I hold [WikiLeaks editor Julian] Assange in high regard in many issues of state. I take very seriously his statement that he received no information from Russia or any state actors,” Stone said. WikiLeaks published over 250,000 classified US military and diplomatic documents in 2010 in a move that amounted to the largest information leak in United States history. Hillary Clinton was Secretary of State when WikiLeaks published ‘Cablegate’. Assange has been stuck inside the Ecuadorian embassy since he took refuge there in June 2012 to avoid extradition to Sweden where he is wanted for questioning by the authorities regarding allegations of sexual assault against two women in 2010. 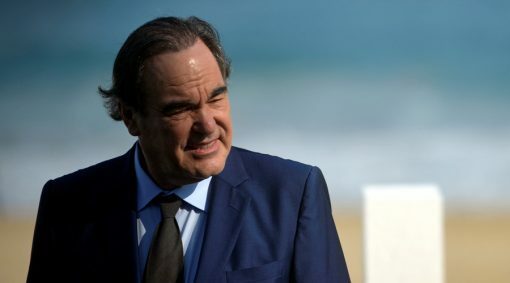 Stone’s latest movie revolved around NSA whistleblower Edward Snowden, who became world-renown figure after leading classified documents detailing the surveillance programs of the US intelligence agencies and its allies in 2013. Stone met him in person in Russia, where Snowden was granted political asylum. The director said Washington’s unprecedented move towards far-reaching surveillance technology is utterly wrong. The RT network now consists of three global news channels broadcasting in English, Spanish, and Arabic. Read other articles by RT, or visit RT's website. This article was posted on Tuesday, May 9th, 2017 at 4:49pm and is filed under Russia, Whistleblowing, WikiLeaks.